We're sorry, but this item is no longer for sale. 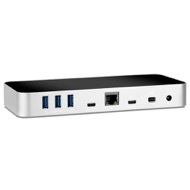 However, there may be more USB-C, USB Type C » USB-C Multi-Function » USB-C Docks & Hubs items available. OWC Dock Ejector software safely disconnects drives in a single click. Designed by OWC hardware and software engineers, Dock Ejector ensures all data is written before disconnection, saving time and protecting against data loss. 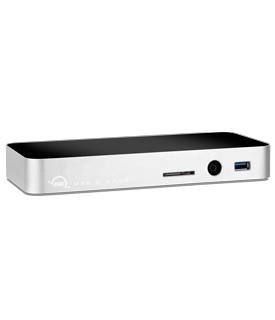 Use it to move quickly between workstations and get the most out of your OWC Dock. Learn More and Download the OWC Dock Ejector Now. 6. Not compatible with the 27" Apple LED Cinema Display. There are no known issues with the 24" Apple LED Cinema Display. 7. Occasionally, when waking from Sleep in macOS a warning may appear that one or more USB devices were ejected incorrectly. This is not caused by the dock. Your devices are still connected and you can simply dismiss the warning. Rating: 5/5 Perfect for my needs. October 12, 2018 Great little docking port. Rating: 5/5 Exactly what I wanted March 16, 2018 I wanted a replacement for a power supply and a video adapter. This Dock is everything I needed. It works consistently with both external usb and the HDMI connection. Rating: 5/5 A great desktop solution January 9, 2018 I previously rated this dock poorly because of some ongoing graphics issues with my external displays. However, the problem originated with a defective cable and I now love this product. If you want to expand connectivity and don't care about portability, this is a great (and great-looking) solution! Rating: 4/5 Great product October 23, 2017 This dock is exactly what I was looking for. I have an older display that uses Mini DisplayPort and needed a hub to connect it and my new MacBook Pro. I love that it has an SD card reader, I use it all the time. My only issue so far is that the dock was disconnecting from the MacBook Pro whenever the display went to sleep. This issue seems to be resolved with a different USB-C cable. I still highly recommend this dock! Rating: 5/5 Works with new MacBook Pro September 6, 2017 I bought this to work with my new Thunderbolt 3 MacBook Pro because #1 it was cheaper than the T3 dock and #2 it had the option for HDMI. I should add I also have the T3 dock since I have two locations. In short, it does the job. It also keeps my MacBook Pro charged despite the apparent decreased voltage of USB-C vs T3. I needed HDMI. There is a second model with display port; the T3 has mini-display port, which works with the original Apple Cinema Display. Rating: 4/5 It works! August 14, 2017 Although it doesn't have room for all of the devices I have to connect to my new MacPro, it has plenty of room for the important ones. All I have to do is disconnect the ones that I'm not using and connect the ones that I need and it's good to go. Rating: 5/5 Great dock July 23, 2017 This dock delivers on the promise of USB C in the newer MacBooks. One connection and I have instant access to hard drives, Ethernet and charging for my all my devices. I leave it where I am working and leave all my chargers at home. The dock is well constructed, the use of aluminium is appreciated, and the colour match with my MacBook is good. Premium product. Recommended. Rating: 5/5 Works like a dream July 21, 2017 My primary reason for purchase was to drive my (non thunderbolt) 27" Apple Display with my 2016 TouchBar MacBook Pro. Everything is plugged in and works wonderfully. I would like the USB-C cable that comes with the unit to be twice as long - as it is I have to keep the dock very close to the MacBook Pro and as a result I have a very untidy cable set up. I do not know if there are other cable options here, or if the length is restricted because of technical reasons. Rating: 5/5 Great product with great features July 20, 2017 I put off buying one of these because of the cost, but I'm glad I did. I wasted too much money on dongles when this one device covered everything I needed. And it looks good. Had it for a month with no issues. Rating: 5/5 Lots of ports for lots of uses! April 30, 2017 The MacBook Pro only has two ports, which is fine when you are on the road and don't really need to connect much, but you absolutely want a dock to take over all those functions that make sense when you are at home or in the office. This one fits that bill perfectly. It looks great, functions as anticipated and is generally just another great product from OWC. Highly recommended. Rating: 4/5 Exactly as expected February 19, 2017 This hub arrived in a short period of time and performs exactly as expected. Easy to use and connect, good product. Rating: 3/5 Missing HDMI support above 30hz. Great otherwise. February 6, 2017 1. With my old 23" Apple Cinema Display with an HDMI/DVI dongle, sadly, the dock does not work. The display is strictly 60Hz. The dock only supports 4k/30Hz max. (With the official Apple Multi-port HDMI adapter, the monitor/cable/dongle does work, if you're wondering.) 2. Use the included cable, or one that can support the USB-C + networking + display bandwidth. Not all USB-C cables support that. The included cable is designated 'SS' for Super Speed. Doesn't seem to be SS+ See http://tidbits.com/article/16870 for gory details. 3. Physical design is smart and matches my silver MacBook 2016. 4 The power brick is a bit old school heavy and clunky. 5. OWC support was awesome in resolving my questions. Rating: 5/5 Ideal for 13" MB Pro 2016 January 31, 2017 I needed a hub to use peripherals with the legacy USB-A connector; the hub also needed an HDMI connector, SD card reader, pass-through charging at roughly 61W, and USB ports that would allow me to take advantage of USB 3.1 speed. The hub worked as advertised. I can only think of two minor issues for improvement: It provides 60W of charging (I'm not sure if this makes an actual difference as a practical matter when compared to 61W with Apple's official charger), and I think the connector port that allows for pass-through charging should be located in the front rather than the back. 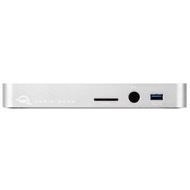 Another positive - The open-box option made this hub far more affordable than the Thunderbolt 3 dock, which is not yet available anyway. Rating: 3/5 Intermitten Issues January 26, 2017 I have a new MacBook 13 Inch with the USB-C connections. When I disconnect my laptop from the dock, and then come back and connect again, my keyboard sometimes does not work in the USB drives. Tried them all. Also, my monitor video goes in and out connected to the HDMI port. I would only recommend because Apple does not make a docking station for its MacBooks. So, your options are limited. Rating: 3/5 does not respond correctly to laptop sleeping January 21, 2017 Every other OWC product I've purchased worked seamlessly, but this dock does not wake up after your laptop sleeps. You are forced to unplug it and plug it back in to get it to reconnect. This means that when your laptop goes into sleep mode it stops charging from the dock. When I asked OWC support about this is normal behavior for this dock. I've also had issues with USB drives plugged into the dock not being recognized. These same drives work fine on my old iMac. Partly I blame Apple for not putting useful connectors on the MacBook Pro, but I was really hoping that OWC would fix Apples mistake. Instead it is only a partial solution. The Support people at MacSales were great and sent me two new cables (one for each dock). As soon as I swapped cables, the docks were rock solid, and have been for a couple months. My advice is to buy the dock but to have an extra USB-C to USB-C cable on hand in case your experience is the same as mine. Rating: 3/5 Great dock; bad cable December 26, 2016 The dock has all the ports you would want and is a great addition to a MacBook. I leave it on my desk with all the cables connected to it (HDMI, ethernet, audio, iPhone, etc.) and simply plug it in each morning. I purchased two of these, and the USB-C to Dock cable for both of them is flakey and had to be replaced with a third party cable. One of the cables didn't really work at all, and the other would work for a few minutes at a time. Once replaced with a different cable, each dock has worked great! So, buy the dock. Buy a separate cable (you probably want a little longer one anyway) And enjoy! Rating: 5/5 Great Product December 15, 2016 For those who have to have the newest and greatest (my wife says that describes me) this is an absolute necessity. With the advent of the USB-C all of the other methods of adding functionality to the Mac Pro have been discarded. That means that if one wants to use external drive or a DVD drive you have to have the interface and this does that very well. Rating: 5/5 Great product December 7, 2016 I love this dock and wish that I had ordered it sooner! I was a bit hesitant to purchase for a while due to the price, but it is worth every penny. It should be included with the purchase of any MacBook 12" due to it only having one USB-C port. It is great to be able to sit down, plug the dock in, and no longer have to constantly fuss with plugging and unplugging adaptors. I wish that OWC sold a matching carrying case for it. I do not leave many reviews for products, but this one stands out enough that I felt it justified. Rating: 4/5 Awesome product with 1 flaw November 8, 2016 This is an awesome product for the MacBook. The only flaw that I have in it is that they give you a 12" cable... why not include a 36" cable and allow some room for the desktop. FYI - The MacBook does not like to be in sleep mode and then opened with this dock connected.. you will have to unplug and replug to sync monitor. Rating: 5/5 Must Have for Retina Macbook October 23, 2016 This is my first review on OWC. I am not usually a big review person, but I had to leave one for this product. Being in the IT industry I own many types of laptops. One of them happens to be a 12" Retina Macbook. I can describe how great this dock is in one word, AWESOME! This completely changes the way I can work with my Retina 12" Macbook. I have a faster ethernet connection, I have a sd card reader, more USB-C connections as well as so many more USB 3 ports. Its like having a mini Macbook Pro. It works right out of the box and can't recommend it enough! Rating: 4/5 Pretty good July 28, 2016 I use it with a 2015 macbook. Here is the benefits. Its a docking station. I plug the laptop into via the supplied usbc to usbc connection. It charges and communicates to the base station. on the base station I plug in a logitech usb wirelsss mouse dongle (unifying reciever) so I get a wireless mouse. I also connect a monitor via hdmi. I was surprised that I now have two displays. One desktop on the mac laptop screen and a second extension desktop on the external monitor. I had read it would only be mirrored but on my docking station its a seperate display. i charge/connect my ipod/ipad also via the docking station. So why not five stars? Well, the docking station will not charge attached ipods/ipads if the laptop is not connected. Also sometimes I attach the docking station to the laptop and I find later it did not charge the laptop. I thought at first it was the cable not properly connected, but sometimes it is definitely connected but since the laptop is not powered on it does not charge. I have a refurb unit so maybe that is the reason for the charging problem. Not sure if a brand new one would work better. I would recommend this item to a friend! This review is from (*) OWC USB-C 10-Port Dock with 80 Watt Power Supply - Gold. Rating: 5/5 Great hub for Macbook July 19, 2016 Honestly with two powered USB ports, it's a dang good hub all on its own. I would recommend this item to a friend! This review is from (*) OWC USB-C 10-Port Dock with 80 Watt Power Supply - Space Gray. Rating: 4/5 Solid device, exactly what I've been waiting for May 3, 2016 Like most, I've found the lack of built-in I/O on the 12" MacBook disappointing. I've gone through 3 different adapters but neither had all of the functionality I wanted and the ones that did were from manufacturers I wasn't familiar with. I bought this knowing OWCs reputation and, so far, haven't been disappointed. The biggest pro for me (outside of finally having Ethernet, more than 3 USB ports and power) is I was able to consolidate the clutter above and below my desk. The two high powered USB ports do charging duty instead of having separate power adapters for my MacBook, phone and tablet. The built-in headphone jack, while audio quality is not the best, means I only have to disconnect the USB C cable if I need to get going in a hurry. Sure, that's not a huge selling point, but have one less cable to unplug is still having one less cable to unplug. Overall, I am very please with this dock. Fit and finish is great and it delivers on functionality. I just wish this had come out sooner instead of having to hunt and waste money on adapters that didn't do everything I wanted. This review is from (*) OWC USB-C 10-Port Dock with 80 Watt Power Supply - Space Gray. I preordered this dock back in July of 2015 because I immediately recognized that I was going to want ways of connecting my 2015 Macbook to a variety of devices. Over the next few months, I got emails reporting that it would be out soon, and it arrived in January. I was forgiving of the delay, because by then I had enough experience with Type-C to suspect that the electrical engineering might have been tricky. My specific wishes were to be able to bring the Macbook home and plug it into a dock that added to it the following components: 1. a backup drive for Time Machine to use 2. a large-screen monitor 3. an Apple Superdrive for reading and writing DVDs 4. some spare USB ports for trying out alternative pointing devices. The OWC Dock handled wishes 1 and 4 with no sweat. Wish 2 was a different story. My monitor, a bit long in the tooth, accepts VGA or DVI input. Since the large screen was a requirement from the get-go, back when I bought the laptop, I also bought the Apple format converter that plugs into the Type-C socket on the computer and provides a USB socket, a DVI socket, and a Type-C socket for power input. Back when I preordered the dock, I had no reason to believe I would not be able to combine this converter with the dock by plugging the computer connection of the converter into the Type-C output socket on the dock. But when the dock arrived, the documentation with it warned that such a connection would not work, and sure enough, it didn't. Of course, if I just had an up-to-date (i.e. HDMI) monitor, this problem would not have arisen, but a new monitor was not in my budget, so I embarked on a number of experiments. Conclusion: If you take a dongle that was designed to plug into the Type-C socket on the Macbook 2015, and instead plug it into the Type-C output socket on the dock, the results are unlikely to be what you had hoped. Note: Most Type-C dongles have a Type-C plug to go to the computer (thus consuming the Macbook 2015's connection to line power), but do not provide a Type-C socket to restore the ability to connect to line power, as does the Apple converter that I bought with the laptop. The dongles therefore can only be used when the laptop is running on battery power. There was a solution, however, in a converter that plugs into the DVI socket on the monitor, and converts it to an HDMI socket. Then add a plain old HDMI cable running from the HDMI socket on the dock, and you are in business. Yet there remains a small, intermittent annoyance that is probably not the fault of the dock. The last few OS Xs have had trouble recognizing an external monitor, and have often needed to be burped when connecting by making a hot plug-in. Whew! That leaves wish 3. 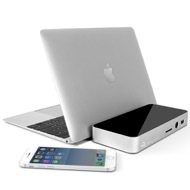 The dock provides regular USB ports plus two "high-power" ones for charging devices. I had already learned that the Superdrive is something of a power hog because the laptop won't run it when running on battery. So I plugged it into a high power port on the dock. Still no luck, I got a diagnostic message indicating not enough power. Tech support informs me that for the Superdrive you need a Y-cable, one that plugs into TWO USB ports and provides a socket on the other end supplying signal from one and power from BOTH. OK, I get on Amazon and order one. It takes a few days for it to get from the manufacturer to Beijing and another week or so to get to me. And that did not work either. The only combination of my gear that runs the Superdrive is to use the USB port on the Apple converter that I bought along with the laptop. So I got three of my four wishes, and I can get the Superdrive by temporarily replacing the dock with the Apple converter. Looks like I got a bit close to the bleeding edge this time. The OWC dock looks great, provides a package of services that a lot of Macbook 2015 owners are going to need, and helps control the tangle of cables. If possible, borrow one and test it on the configuration of devices you had in mind! I would recommend this item to a friend! This review is from OWC USB-C 10-Port Dock with 80 Watt Power Supply - Gold.